The basil family of herbs is one of the oldest and most commonly used herbs in the world. The variety known as Thai basil is no exception; it is utilized so extensively in Indian and Southeast Asian dishes that it is practically considered a vegetable rather than a simple herb. In Vietnamese pho, Thai basil has a prominent place on the plate of garnishes that are served along with the steamy bowl of broth, meat and noodles. Because there are so many variants of basil in every corner of the world, it is not really a surprise to find someone confusing Thai basil with one of its cousins. But Thai basil has a unique smell, appearance and taste that makes it stand out from among the others. Thai basil is known by many names. In the West, it is sometimes called licorice basil, sweet basil or anise basil, although there are variants of basil that are also referred to by those names. 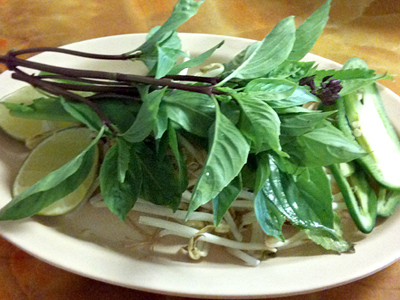 In Thailand, Thai basil is called bai horapa, while in Vietnam, it is known as rau húng quế. Interestingly, rau hung que literally means “cinnamon mint,” though Thai basil is a true basil. This true basil is made distinct by its small leaves, smaller than its western and European counterparts. It also has purple stems; when it blooms, its flowers are also colored purple. There are many varieties of Thai basil grown all over the world, but the most popularly cultivated is called the Siam Queen. As for taste, Thai basil is known for its peppery zing that is coupled with a kind of sweetness akin to that of licorice and anise. This is the reason why this type of basil is also called anise basil or licorice basil. Thai basil should not be confused with Thai holy basil or with Thai lemon basil. These are all commonly used basils in Southeast Asian cooking, but Thai holy basil has leaves that are smaller and velvety in texture. Thai holy basil also smells like cloves. On the other hand, Thai lemon basil smells and tastes like lime, just like its name suggests. The other name of Thai lemon basil is hoary basil. One advantage that Thai basil holds over its numerous cousins is that it retains its flavor well even when cooked. The same cannot be said about the other types of basil, especially the Mediterranean strain that is called sweet basil in the West. That being said, Thai basil is best consumed fresh, just like any other kind of basil. If it is to be preserved, one can chop it and mix it with olive oil or honey to make it last longer. Since it is one of the oldest herbs in use in the world, basil has a long stretch of lore and history behind it. Thai basil is no exception. The herb may be called Thai basil, but its origins are placed in India, where it has been cultivated for at least five thousand years. One of Thai basil’s Indian cousins, the Indian sacred basil or tulasi, is regarded as a holy plant. Tulasi is seen as a representation of the goddess Lakshmi, who is one of the consorts of the Hindu god Vishnu. Basil is often scattered in graveyards in India. Trading took basil to other parts of the world, and the herb gained its own meaning where it landed. The name “basil” actually came from “basileus,” the Greek word for “king.” That is because the herb was often used to treat the ailments of royals, and was often mixed in their baths to keep them healthy. Basil is also a symbol for love in Italy. If a man wishes to marry a woman, he calls upon her with basil in his hair. Ancient Roman marriage practices include exchanging basil leaves or sprigs. In Thailand and Vietnam, and in the rest of peninsular Southeast Asia, Thai basil keeps one healthy. It is more regarded as a vegetable in this region rather than just an herbal garnishing. 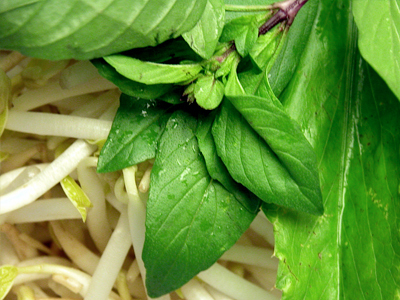 Thai basil is an optional ingredient in Vietnamese pho. Along with bean sprouts, lime wedges and chopped Asian chili, Thai basil is always included in the plate of garnishing that is provided with the bowl of pho (except for the Pho Bac or northern pho variety.) Whether it is to be put in the bowl or not depends on the discretion and desire of the person eating it. What does Thai basil do to pho? As mentioned above, this herb has a peppery taste that can be quite spicy. 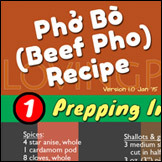 It adds a layer of liveliness to the delightfully complex mix of flavors in a bowl of pho. At the same time, Thai basil is also sweet, a sweetness that is similar to that of anise and licorice. Vietnamese cuisine, just like most Asian cuisines that are heavily influenced by the Chinese, follows the Chinese principle of balance in cooking. What this balance means is that all the five basic tastes of saltiness, sweetness, spiciness, bitterness and sourness should be present in every dish. However, these flavors should be in harmony with one another instead of fighting it out in one’s tongue. Vietnamese cooks always strive to achieve perfection in their food by creating the right balance between these five tastes. It is no different with Vietnamese pho. Most people throw in the basil leaves and let them cook in the bowl as they eat their pho. For those who want to maximize the taste of Thai basil in your pho, do this instead. Pluck and gather a few leaves together and pinch/tear them into smaller pieces into the bowl. This releases all the basil's fragrant flavors and aroma more quickly and intensely, so you get to enjoy it even before eating it. The next step is to not cook them in the broth. Don't push them down into the hot broth but just let them be on top of everything. You'll get to them when you get to them. By doing this you'll get the freshest possible taste of basil as you enjoy the rest of the pho ingredients. Thirdly, put them in as you progress with your pho. Don't put them all in at once at the beginning. Pace them out over the course of your pho adventure, and stop after maybe 2/3 of the way. This is because if you continue after the broth has cooled then you're essentially eating raw basil which may be too pungent for some. Finally, for the maximum Thai basil effect, you can obviously use more of it with each and every mouthful of pho. I'm more in the #3 and #4 camp myself. Thai basil is a kind of herb that can be grown successfully both indoors and outdoors as long as it has access to sunshine at certain periods during the day, it is regularly and liberally watered, and it is planted in well-irrigated soil. There are actually many cultivars of the Thai basil, though, as mentioned above, the most popular of them is called the Siam Queen. This type of basil is pretty much resilient regardless of the climate and can be grown all year round, although it does not really like the cold. Another beautiful fact about Thai basil is that it is believed to repel garden pests like aphids and mites. This is why many gardeners choose it as a companion plant to protect their more susceptible plants. If the Thai basil is to be planted at an outdoor garden, its seeds must first be prepared and allowed to germinate indoors. The seedlings can then be transplanted to their outdoor plots when they become two or three inches tall. In addition, the seedlings must be planted eight inches apart from each other. 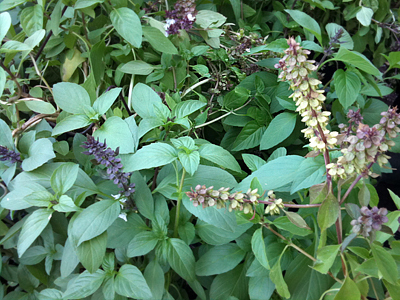 Thai basil can be harvested by plucking or cutting one leaf at a time as needed for cooking and other purposes. However, to encourage the herb to grow more leaves, it is recommended that the third top of the stem be cut instead. When cutting leaves and stems, clean and sharp gardening scissors should always be used. 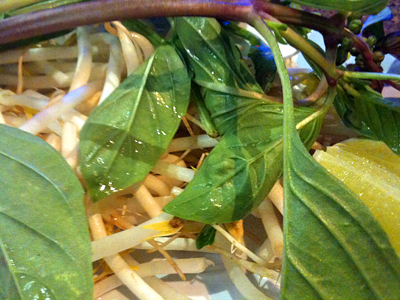 Thai basil adds a sweet and zesty layer of flavor to the dish, and it can help enhance the richness of pho. 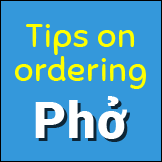 Readers to LovingPho indicated in the What's in your pho? poll that Thai basil is one of the top 3 items they prefer in their pho bowls, right up there with bean sprouts and lime. It beats out culantro, hot chili sauce, hoisin sauce for pho, and sliced peppers. So for those who have decided Thai basil is not for them: maybe it's time to try it again? Recently the garnishes for my Pho included a stalk of Thai basil that was flowering. I put it in a glass of water, and it grew roots in about a week. Transplanted successfully to a flower pot. Repeated the process and now have two or three pots and two or three plants in the garden, so I should never run out! Hi George: Congrats on successfully growing your own basil! You’re absolutely right, never run out of the good thing, always have fresh basil. Nice! Pho seafood is not exactly authentic pho. Your opinion? Tried it & liked it. Will eat again. Tried it & hated it. Never more. Pho bo or pho ga only please. Do you like the new modern, open service, or are you ok with mom & pop table service? New, modern all the way, if pho is good. 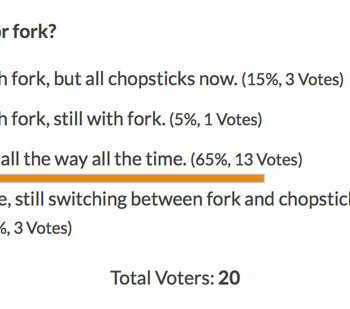 Prefer mom & pop, if pho is good. Either one, if pho is good. No preference, whatever is convenient at a particular time. Mom & pop table service is an oxymoron. 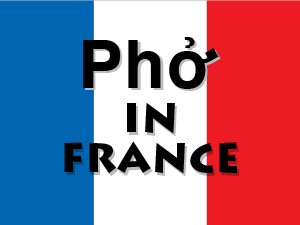 What best describes you and your pho preference. 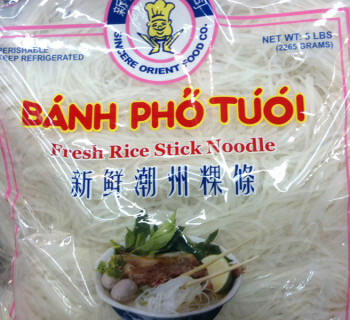 Is It More Than Just Spices That Make Real Pho? 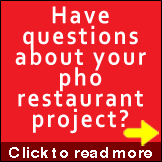 How Much Does It Cost To Build And Open A Pho Restaurant?